Insight Panels are the heart of Avantalytics. Displaying important information beautifully, Insight Panels are highly customizable and can be used to run reports quickly and intuitively. 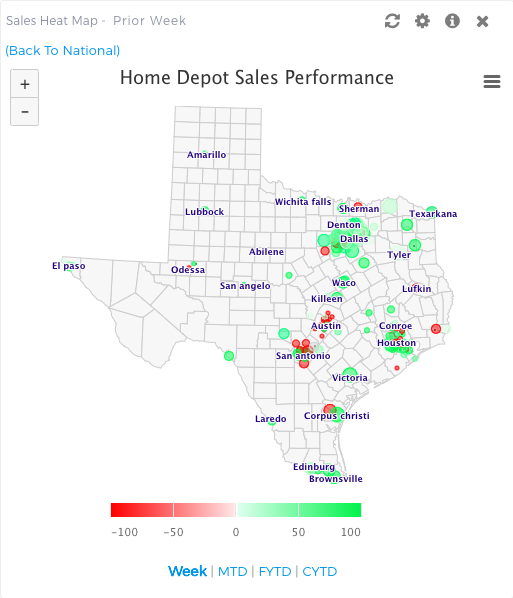 Creating a custom Insight Panel view allows for visual access to dozens of reports and key metrics, all with some drag-and-drop action and a few clicks of your mouse. Most users can monitor and analyze their business without ever entering the reporting interface, just by setting up a few customized views. Most Insight Panels are designed to provide helpful default settings right "out of the box". The real strength of them comes from their pre-built but customizable attributes that allow you to adjust what you would like to see to quickly create a specific view instead of just canned overviews. Insight panels are also incredibly social! You can share almost any view you create with colleagues and clients. You cannot share your "default" view or your "mobile" view. These are viewable only by you. Nearly every panel can be customized in a number of ways to allow you to view different slices of your business. When you first log into Avantalytics, you will see the Avantalytics landing screen pictured below. The landing page is where to get the latest updates and training videos from Avantalytics, so make sure to always check out what's new. When you set up your default view, that will be the view that automatically loads every time you log into Avantalytics. Your default view should be made up of multiple Insight Panels containing the information you are most commonly seeking. To get started creating your default view, locate and hover over the "≡" icon in the drop down menu in the upper right-hand corner of your screen, and select "default:"
Begin building your view by selecting some Insight Panels from the "+" icon located in the menu bar, again in the upper right hand side of the screen. When you click on the icon, a pop-up appears, with an accordion menu of insight panel options. Expanding and collapsing the categories shows you the different insight panels available for each category. Clicking on an insight panel name brings up a preview of the panel and a short description, giving you an idea of what sort of information you can display on your view. You can add the panel to your view by either double clicking on the insight panel name in the accordion menu, or by clicking the "Add Insight" button. To bring up the settings on an Insight Panel, simply click on the gear icon, located on the top right of every panel. Below is the "Sales Heat Map" Insight Panel, demonstrating some typical ways you can customize your panel view. As you can see, it's possible to change a range of variables, such as retailer, sales metric, time period. These metrics, along with several optional features, allow you to create a truly specialized view for your business. Once you've customized your settings, click the "Save" button on the bottom right. The settings menu will disappear and your panel will update. Once you are satisfied with the insight panels you have put together for your view - click the " " icon located in the upper right of the panel to save your view. Once you create your default view, you can move on to create...as many views as you want! Would you like one view to focus on your sales team and one to focus on the weather? You can easily create multiple views specializing in different areas of data, giving you an incredible amount of data analysis right at your finger tips. Best of all, you can clone views and share them with members of your team to also be able to clone the views. Below, we'll show you how simple it is to do this. So, now that you know how to customize and arrange views to start showing the health of your business, it's time to see how to use the panels to better explore what the causes of the strength or weakness in your business might be! Nearly every Insight Panel has "Hyperlink Blue" text. This text indicates links which allow you to run context-sensitive reporting right from the panels. 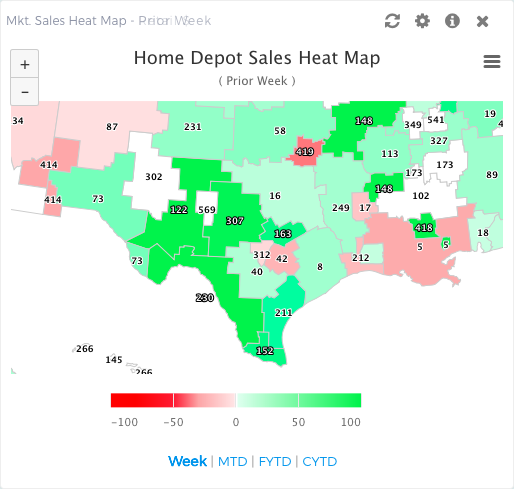 On Insight Panel maps, you can click on the zoom in/out function on the top left corner, click on the states (or markets) and view state-level, market-level and even store-level detail. The point of the insight panels becomes clear when you realize you can create custom views into you business. You can then explore the data more deeply by clicking on the panels to access reporting. The beauty of this is that your report will reflect all the parameters you selected when you created the settings for your Insight Panel. Because of this, you can intuitively explore your sales without having to spend any time creating the report parameters in the reporting library.